Jamaica Palms Resort Caribbean special offer holiday. Sunset at the Palms Resort Accommodation. Every room features an open balcony with a day bed. Satellite TV, free Wi-Fi and a minibar are included. Sunset at the Palms Resort’s rooms are styled with dark-wood floors and have Asian-inspired furnishings. Guests can lounge poolside or work out in the well-equipped fitness center. Other on-site activities include tennis courts, beach volleyball and snorkeling. Sunset Resort’s Palms Spa offers massages, facial scrubs, and body and beauty treatments. Caribbean and international cuisine is served at Palm Grove Restaurant. Fine dining is offered at Lotus Leaf, while sandwiches can be enjoyed beachside at Palm Breeze Bar & Grill. Drinks are available at the pool swim-up Bamboo Bar. Negril Airport is 4.4 km from this resort and the Negril Lighthouse is 9.2 km away. Please note that from 24 December 2013, this property will become an adults-only resort. Jolly Beach Jolly Harbour Villas on Antigua and Barduda Island in the Caribbean. Featuring two double rooms with en-suite bathrooms, the accommodations are also equipped with free air conditioning, and free cable TV. Bathrobes, towels and beach towels will be provided. The property’s owner will cooks in typical Italian cuisine. The international-style breakfast is included in the rate and, upon request, it is possible to have any dinner prepared for you for an additional fee. In the outdoor area there is a relaxation area with pool and garden to be pampered and enjoy the beautiful colors of nature. Other facilities available include a shared lounge and laundry facilities. An array of activities can be enjoyed in the surroundings, including golfing, tennis, cycling, and horse riding. The property offers free parking. Score from 38 reviews: Very good 8.2 There is 1 person looking at Accommodation for this resort. Each block of 4 rooms has a private entrance. Decorated in natural tones, the air-conditioned rooms include a four-poster bed, free Wi-Fi, an LCD TV and an iPod dock. Sugar Ridge Resort LTD has a gourmet restaurant, which offers fusion cuisine and incredible views of the bay and nearby islands. The lively Sugar Club serves light meals, including pizzas, tapas and sushi. Electric buggies can be hired from reception to explore the island. Just 600 metres away, Jolly Harbour offers regular diving and fishing boat trips. Antigua’s capital, St. John’s, is a 25-minute drive away. 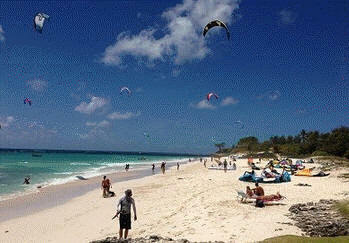 Caribbean Barbados Silver Sands Caribbean special offer villas. Each spacious, air-conditioned apartment at this property comes with a fully equipped kitchen, balcony with sea views and a comfortable seating area. They also offer a cable TV and a spacious wardrobe. Guests can find a host of dining options within 1 km of the property, including an Italian restaurant only 250 metres away. The area also boasts several bars and nightclubs. There is a golf course located only 3.7 km from the property, and the property can help guests arrange outdoor activities like snorkelling, diving and fishing. Sheraton Shopping Centre is a 10-minute drive from the property, and Grantley Adams International Airport is 10 km away. The attractive studios and apartments at Ocean 15 have cooling brick walls and white bedding. The kitchenettes come with a fridge and coffee maker. Guests can swim in the outdoor pool and have a drink at the poolside bar. The property also has a restaurant and a coffee shop. Karaoke is available on Sunday nights. The Ocean 15 Hotel is located on St. Lawrence Gap, a 15-minute drive from Grantley Adams International Airport. Lonely Planet Discover Caribbean Islands (Travel Guide). Lonely Planet Discover Caribbean Islands is your passport to the most relevant, up-to-date advice on what to see and skip, and what hidden discoveries await you. Swim below the waters with darting fish, wander along the sand and stop at a lazy beach bar, or hike into emerald wilderness; all with your trusted travel companion. Get to the heart of the Caribbean Islands and begin your journey now! Cultural insights give you a richer, more rewarding travel experience – background on slavery and piracy, wildlife, cuisine. Jamaica island – The third largest island of the Greater Antilles. Geographically speaking, Jamaica is an island of intense color and contrast offering miles of tropical beaches and bone-dry plains set amidst the misty Blue Mountains. Socially speaking the island is full of some of the most down to earth and fun people you will ever meet. Honeymooners may enjoy an entire vacation without ever leaving the sanctity & peace of their all-inclusive resort grounds, making this oasis feel like your very own. Jamaica was the first destination, courtesy of Sandals Resorts, to cater to Honeymooners with the All Inclusive concept and it was a forerunner in the creation and popularity of destination weddings. Many have said to not miss dinner via houseboat while floating through a most romantic atmosphere. Jamaica offers endless activities from golfing, diving, sports and swimming. Don’t miss stopping by the colorful local markets! Be sure to watch to see the local fisherman coming ashore with the catch of the day! Be sure to visit Dunns River Falls or enjoy an afternoon via horseback as you ride down the beach enjoying both the mountains and gorgeous waters. Passports for the Caribbean are required, so be sure to have yours up to date. Have you found a suitable hotel in the Caribbean and now you need some money? Site to help http://www.getcashngo.net/. Take A Break Holidays Takeabreakholidays, Caribbean Accommodation.